We've tried tons of different recipes in search of the perfect chocolate chip cookie. For a while we just used the recipe on the back of the Nestle Toll House chocolate chips bag, and these tasted great. But we've had better, so we knew that there must be a better recipe out there somewhere. There's the New York Times' recipe for what they consider to be the best, which uses a mix of bread and cake flour, and requires overnight refrigeration. But who wants to wait 24 - 36 hours, and buy two different types of flour that you might not already have on hand? Then there's the Food Network's "Best Chocolate Chips Cookies Ever" recipe, but these tended to be too dry due to a higher flour content. Then one day I came across a TV show called America's Test Kitchen. Since I don't have cable, I'm limited to network shows and public television, and ATK fortunately airs on the latter. For those who haven't seen it, ATK usually focuses on one or two recipes each episode, where they show you how to make something that they spent weeks testing out different variations of recipes, until they've found the best combination of ingredients and techniques to produce the most scientifically sound results. While that sounds a bit extreme for the average home cook, the changes they made to the archetypal Toll House recipe really make a huge difference. - Use browned, melted butter for a deep, toffee-like flavor. - Use a special technique of mixing the wet ingredients over a period of 10 minutes to allow the sugar to dissolve better. This saves you time from having to wait for the cookies to sit overnight in the refrigerator. - Use 1 egg, and 1 yolk, instead of 2 eggs. The white is 90% water, which adds more liquid than is necessary to dissolve the sugars and affects the texture. - Make larger cookies, for a better consistency. - ATK found that Ghirardelli bittersweet 60% cacao baking chips worked the best. We agree. The key is to use wider, larger chips. Discs and chunks would also work well. - Use more brown sugar (specifically dark brown) than conventional granulated. Whisk flour and baking soda together in a medium bowl and set aside. Heat 10 tablespoons of butter in a 10-inch skillet over medium-high heat until melted, about 2 minutes. Continue cooking, whisking constantly until butter is dark golden brown and has nutty aroma, 1 to 3 minutes. Remove skillet from heat and transfer browned butter to a large bowl. Stir remaining 4 tablespoons butter into hot butter until completely melted. Add both sugars, salt, and vanilla to bowl and whisk until fully incorporated. Add the egg and the yolk, and mix well for 30 seconds. Let the mixture sit for 3 minutes, then repeat the process of mixing and resting two more times, until the mixture is thick and smooth. Add the flour mixture to the wet ingredients, and manually mix with a spatula until just combined, about 1 minute. Add in the chocolate chips, and briefly mix to incorporate. Cover the bowl and let cool in refrigerator until solid, about one hour. The dough can sit overnight, but this isn't necessary. Preheat oven to 375, and line two large baking sheets with parchment paper. Remove dough from the refrigerator, and divide into 16 portions. This is most easily done by splitting the dough in half, then quarters, and then making four portions out of each quarter. Roll each of the portions into a ball, and place on cookie sheet. 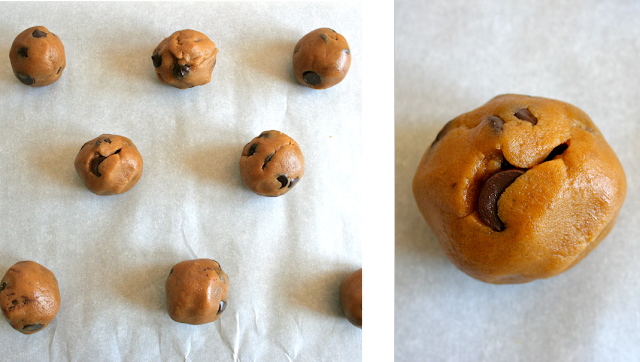 Do not put more than 8 balls on a sheet, or they might run into each other during baking. Bake each sheet separately for 10 - 14 minutes, rotating the sheet 180 degrees halfway through the baking time. The cookies are done when the edges are set and slightly browned, but the centers are still puffy and soft. Let the cookies cool for at least five minutes before moving them to a cooling rack. I keep reading about these cookie and really MUST try soon!! They look fab!